Electric wheelchair scooters are a blessing for a physically disabled person. Once a time when disabled persons couldn’t go to long distance by themselves. But in the electric wheelchair, the user can go to a long distance by the power of battery and motor. With the help of joystick, these electric wheelchairs can be operated easily. These wheelchairs give freedom to the physically disabled more than anything does. Electric wheelchairs made the physically disabled persons move freely by themselves without depending on other at home or outside. Most importantly, these wheelchairs are also cheap in price. Here we will provide some vital information about electric wheelchairs, best electric wheelchairs in the market, their benefits, and tips to buy them. Best companion: In the general wheelchairs, cripple or physically disabled persons hardly move without the help of others. And if they want to go to any place on their own, standard wheelchairs are the main obstacle as these are not able to go far. On the other hand, electric wheelchairs have easy operating system, which leads the users to control them very easily. Moreover, with the help of battery power and the motor, a physically disabled person can move freely in the house or can go any place around the house, near or far by his wish. As disabled persons cannot drive general vehicles, these electric wheelchairs are the best vehicles for them. Easy use: Standard wheelchairs are manual, which means the users have to use hands to control and to go anywhere. That is certainly making it tough for the users. But an electric wheelchair has a joystick controlling system, which helps the users to control the wheelchair with the use of fingers and with the joystick attached in the armrest of the wheelchair. 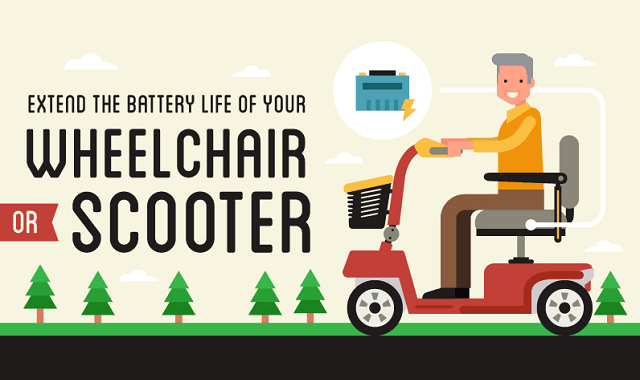 Battery power: Battery power runs electric wheelchairs, and it helps the users to use for a long time. 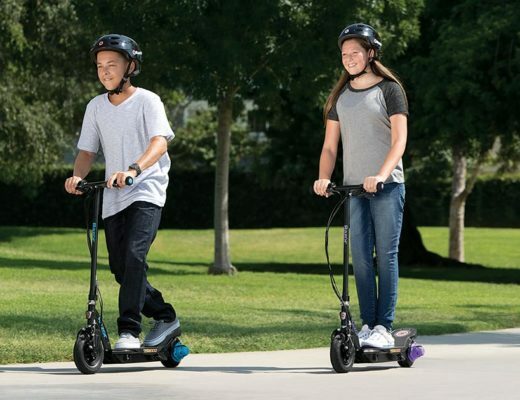 With the battery fully charged, they can cover a long distance at any place getting the freedom to go anywhere they wish. Safe: These electric wheelchairs have a durable and sturdy structure, which gives stability to the wheelchairs to ensure safety. The rear and front wheels provide a safe, smooth and comfortable ride to the riders. Comfort: General wheelchairs are for just essential use for the riders, but in an electric wheelchair, users get maximum comfort. The seats of the maximum portable electric wheelchairs are cushioned to provide softness, and the seats are reclining. There are backrests to provide perfect support. The armrest and the footrest help the users to sit with ease in the wheelchair. Portable: Most of the electric wheelchairs are lightweight electric wheelchair because they have a very lightweight. 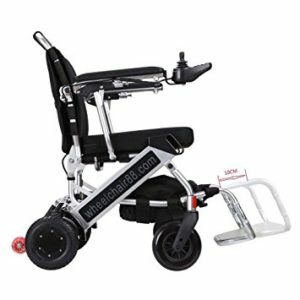 Electric wheelchairs are quick and easily foldable, and that’s why these are very convenient to store and to carry in any place. A great portable electric wheelchair for the physically disables, which is operated by the joystick. With the use of a hand, a rider can control the wheelchair with ease to go anywhere. The Lithium battery is rechargeable and can go more than 10 miles on a single charge. Users can attach a secondary battery for increasing the distance. 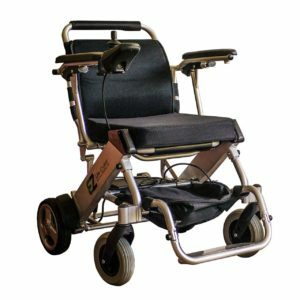 The rider can sit with comfort in this wheelchair as it has armrests in both sides and the armrests can be raised for the perfect adjustments. This electric wheelchair is made of high-quality steel to make it sturdy and durable. That’s why it is perfect to use for long. The main feature of this wheelchair is its portability. It folds easily and less time and energy spend to fold it. When folded it takes a small place to store. That’s why it is very easy to carry in the small vehicles like car or SUV to go anywhere. 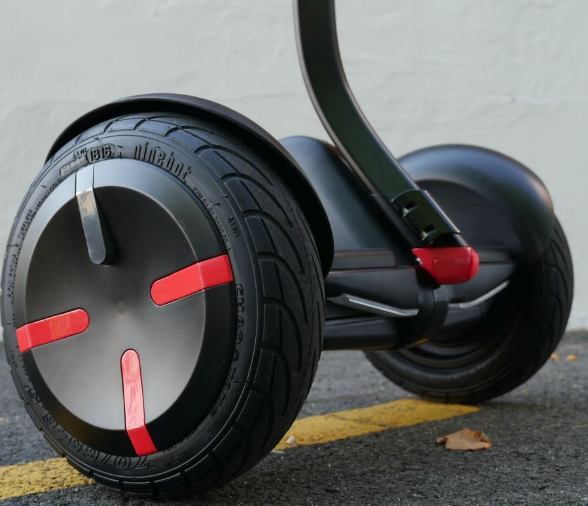 The 4 wheels ensure the safety and smooth ride to the rider without any bump. With the use of these wheels, this electric wheelchair can turn any tight areas. The soft seat is reclining and can be removed for convenience. This well-used electric wheelchair has footrest to sit with maximum comfort for the user. The weight of this electric wheelchair is 50 pounds, and with this weight, it can bear the weight 264 pounds of any user. 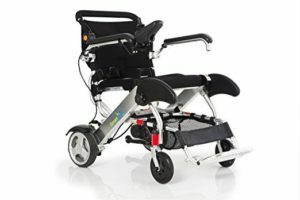 A great portable electric wheelchair, which has amazing 2 seconds opening and folding quality for easy use and storing. After folding, this electric wheelchair gets a compact size, which makes it portable. This wheelchair To carry easily to any place, this wheelchair includes a carry bag with it. Another important thing is, this wheelchair has a weight of 55 lbs, but it can bear the load of 400 lbs easily. The Lithium battery of this wheelchair gives a long 15 mile continue to ride with a single charge. The battery takes only 4 hours to get a full charge. The powerful motor delivers a speed of 5 mph for the convenience of the users. The Joystick helps the user to operate the wheelchair with maximum ease and fingers are enough to control the whole wheelchair. 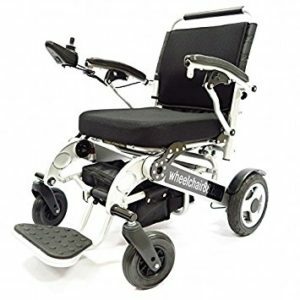 4 wheels of this electric wheelchair are very smart to provide the best experience of riding and to ensure the best security with comfort; these wheels have spring suspension. These wheels also help to move it when folded. Cushioned seat gives extra comfort, and reclining facility enables comfortable seating. The armrest and the footrest help the rider to ride and sit with relaxing. Are you looking for a wheelchair, which is eco-friendly? You can certainly choose this one as it is run by battery leaving no smoke or other harmful objects behind. This electric wheelchair scooter is one of the most popular as it has a low maintenance cost and very easy to use. Its weight is 50 pounds, and this weight is the perfect to carry it easily to other places for traveling. Within seconds, it can be folded. It gets a very little size when folded, which is perfect for storing in your closet and carrying in an SUV. This electric wheelchair has 4 wheels, and rear wheels are extra large to ensure safety and security while riding it. A heavy-duty Lithium battery runs this wheelchair, and this battery gives an extra mileage of more than 15 miles on a single charge. As standard wheelchairs have to operate with both hands and quite difficult to operate, this electric wheelchair is very easy to control as it has a joystick in it. The structure of this wheelchair is made with top quality materials to make it durable and to use it anywhere. The reclining seat helps the users to sit with comfort. The armrest and the footrest provide comfort and ease to rest. An amazing electric wheelchair, which is improved than before. All its features are improved to use it more conveniently. First of all, as this wheelchair will be used by the physically disabled persons, it is made with a lightweight to control it easily by them. It weighs only 45 pounds. That makes it very much portable to any place. This electric wheelchair has a quick foldable facility within just 5 seconds. It helps the users to carry easily to anywhere. This quick folding also contributes to store the wheelchair with ease, and that’s why this wheelchair is one if the best folding electric wheelchair. When folded it gets a nice and compact shape to store and carry easily. The Polymer Li-on battery has a longer life than the other batteries in the other electric wheelchair. Many of the customers are still using the battery even after 4 years of use. This battery gives a continued ride of 8 miles in a single charge. Users can attach a second battery to cover the twice distance. The brushless motor of this electric wheelchair is smart enough to give a comfortable speed. To make it perfect for the users, this electric wheelchair has version 3 controller system for easy controlling. To provide greater stability and for smooth and bump free ride, it has 7-inch large front wheels. The wheels also ensure the safety of the rider. The soft cushioned seat is reclining and has backrest to sit with comfort. The backrest covers are removable to wash. The footrest helps to sit with ease, and it can be extended 10 cm towards the front. The armrests can be lifted to a comfortable height for convenience. Having all these great features, this electric wheelchair also includes a storage bag to carry it easily. 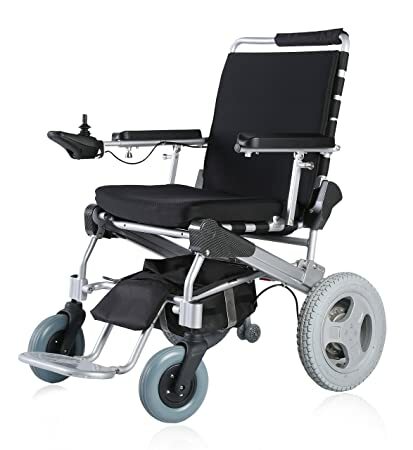 This electric wheelchair is one of the best lightweight electric wheelchairs in the market. For the convenience of the users, this wheelchair has a very quick folding and unfolding. It gets a compact size when it is folded and very easy to store in a small place. This wheelchair has a very light weight of 58 pounds. That makes it portable to any place. The greatest and the most convenient feature of this wheelchair is its hand operated controlling system. It has a joystick to operate easily. The joystick can be mounted on any of the armrests. For the comfort of the user and easy side access to the seat, the armrests can be raised easily. The 10 Ah Lithium battery is heavy duty, and with a single charge, this wheelchair can run up to 10 miles. For the safety and a smooth ride, this wheelchair has 12-inch rear wheels. 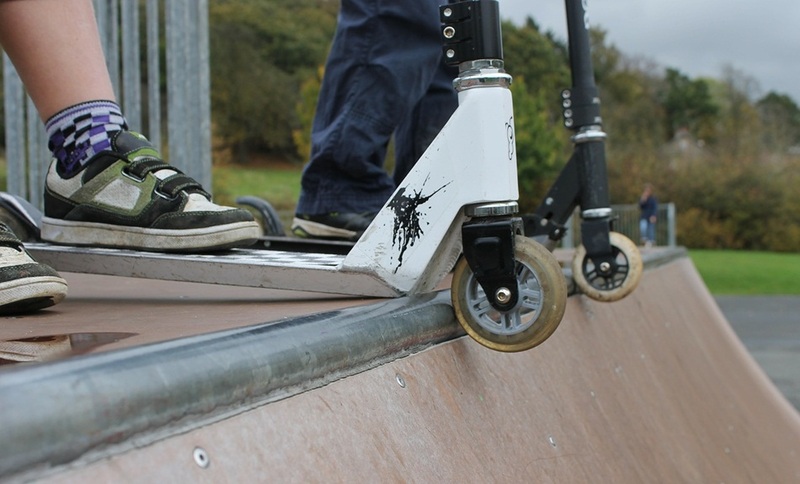 Wheels help the rider to turn the wheelchair easily in any tight areas. To provide maximum comfort to the rider, this electric wheelchair has a footrest. The comfortable seat is reclining, can be removed and has an easy cleaning facility too. Made with all high-quality materials, this electric wheelchair is strong and durable to use at indoor and outdoor for long. The materials of the electric wheelchair must be top quality. A high-quality product provides the best service for a long time. So make sure that you are going to buy the best quality electric wheelchair. As the physically disabled person will use the wheelchair, he/she will stay in the wheelchair for long. For making the person comfortable in the chair, the seat has to be soft and comfortable. The seat must be reclining and cushioned. Backrest, Armrest, and footrest must be in the electric wheelchair to seat with ease. Make sure that joystick operates the electric wheelchair for making the user relaxed. The wheelchair needs to be folded and unfolded quickly and easily. 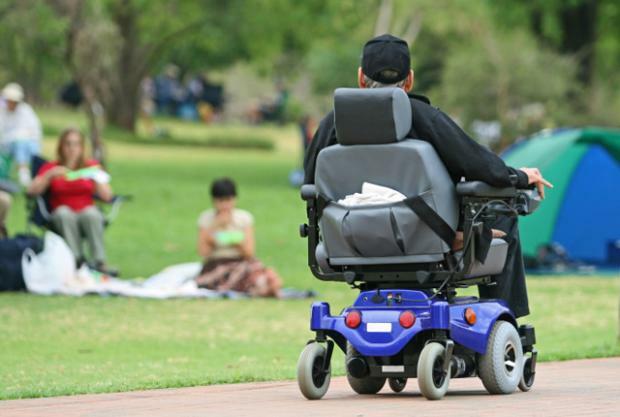 Physically disabled persons need the wheelchair all the time. When they travel to any place, they also need it. So you should buy a portable electric wheelchair which has a quick and easy folding facility.Also having an lightweight electric wheelchair is always convenient. It will enable the wheelchair to carry any place. Some electric wheelchairs provide storage bag with them. Go for them. As the user of the electric wheelchair will be in it for a long time, it must have strong and durable structure. It should have lightweight but has to hold the load of the user. All the materials of it must make it durable. The speed of the electric wheelchair needs to be moderate to control it easily. It must have a superior stability and strong structure. Large rear and front wheels also ensure a smooth, comfortable and bump free ride for the user. A heavy-duty battery gives long mileage with a single charge. You should careful about the battery life. Go for the quick charging and long life battery. The motor is equally important as a good motor gives good speed. Top quality electric wheelchairs are expensive. But always keep in mind that all the expensive products are not top quality and all the cheap products are low quality. You must go for the best one in an affordable price. 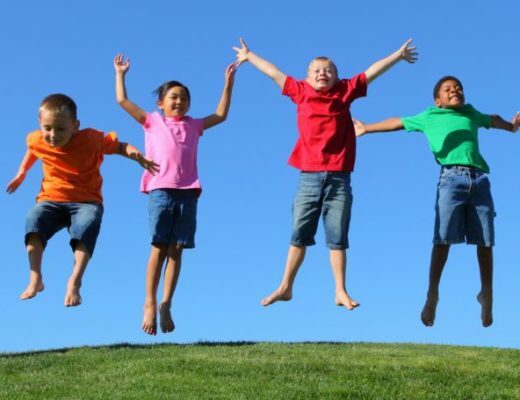 Do you want to make your physically disabled family member or friend happy? Buy one of these electric wheelchairs. It is the best way to make him/her smile.Remember each of this wheelchair are unique and just pick the one that suit you most.